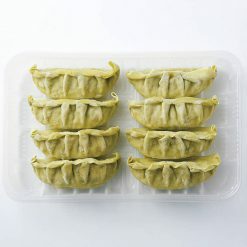 Large gyoza, filled with a combination of 6 kinds of vegetables and lightly seasoned. Package contains 272g (8 pieces, 34g each). At 34g apiece, these jumbo gyoza are about twice the size of ordinary gyoza. Spinach is kneaded into the dough of their wrappers, making them a vibrant green. Their filling includes cabbage, onions, garlic chives, Welsh onions, carrots, burdock root, and chicken (chicken breast and tenders), and has a refreshing quality. The ratio of wrapper to filling is 3:7. 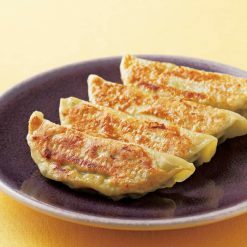 These gyoza are not seasoned with garlic, and so can be eaten at any time of day. 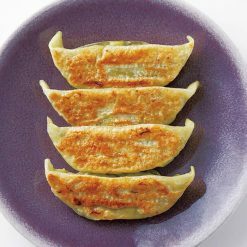 Distribute 1 tablespoon of oil in a heated frying pan, then add the gyoza (still frozen) (if using a Teflon pan, no oil is necessary). Add enough water (about 130ml) to submerge the bottoms of the gyoza, cover with a lid and steam-bake on medium heat for about 5 minutes. Just before the water has all evaporated, lower the heat a little and add 1 teaspoon of oil. Distribute the oil evenly throughout the pan. Fry for about 2 minutes. When the bottoms of the gyoza look pan-fried, they are done. This product contains vegetables (cabbage/domestic, onions/domestic, garlic chives/domestic, ginger/China, Welsh onions/domestic, carrots/domestic, burdock root/domestic), pig fat, chicken, granulated soy protein, sesame oil, soy sauce, table salt, dietary fiber (from wheat), sugar, dehydrated egg whites, yeast extract, pepper, wrappers (wheat flour, spinach, powdered wheat protein, malt sugar, table salt).. This product is not suitable for anyone with allergies to egg, wheat, soy, chicken, pork, sesame or contamination. Origin of ingredients: cabbage/pig fat/chicken (domestic). Prepared and packaged in Japan.